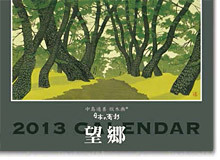 Enjoy the world of woodblock prints which were created by Tsuzen Nakajima, a "hangiga" artist. We noticed that many customers would like to send calendars to their friends outside Japan. Now A4 size calendars are available which are conveniently sent in an envelope. A two-page spread makes an A3 size which is an appropriate size to hang on a wall. An overseas version without holiday indications is being simultaneously released. ●A new collection "Nihon no Omokage - Iki (Memories of Japan - Japanese chic)"
According to numerous requests, this information is given here. * Above shops only sell cards for the season. Please contact Edogabou if you would like other products. Copyright(C)2003-2011 Edogabou All rights reserved.